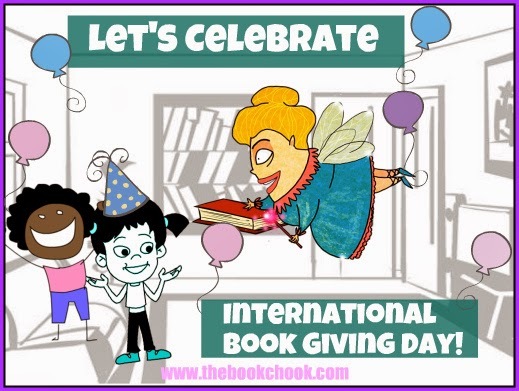 The Book Chook: Let’s Celebrate International Book Giving Day! Let’s Celebrate International Book Giving Day! It’s almost time for International Book Giving Day on February 14, and I’m excited! What is International Book Giving Day? It encourages us to make Valentine’s Day special by giving a book to a child. Some book givers give books instead of the more traditional candy; others do both. It matters not, so long as we prepare ourselves with celebratory bookish thoughts! 2. Leave a Book in a Waiting Room or Lobby: Choose a waiting room where kids are stuck waiting and there are few to no good books available. Purchase a good book, and deposit your book covertly or overtly in your waiting room of choice. The goal here is to spread the love of reading to kids, so choose a fun book, nothing controversial. 3. Donate a Book: Wrap up a box of children’s books that your kids have outgrown and get them in the hands of children who could really use a book or two. Donate your books to your local second hand store, library, children’s hospital, or shelter. Alternatively, donate your books to an organization working internationally to get books in the hands of kids, such as Books for Africa. As I said last year, “What I love about this concept is that it's achievable with very little effort other than taking the time to think of others.” I also appreciate that IBGD emphasises compassion and giving - two qualities we want to encourage in our children. Having kids share a loved book by giving it to someone else is a wonderful way to help them develop empathy. You can download wonderful posters from the IBGD website to help spread the word at school, or in your neighbourhood. Becoming part of a global community, all focussed on getting books into the hands of kids, is a wonderful way to spend February 14. I hope you and your kids will join us! I love this idea, and have reposted your post on this subject on my blog...thank you so much for bringing this to my attention....I love your blog posts too! Thank you for letting me know you duplicated my post on your blog. Feel free to ask anytime you want to use my content.